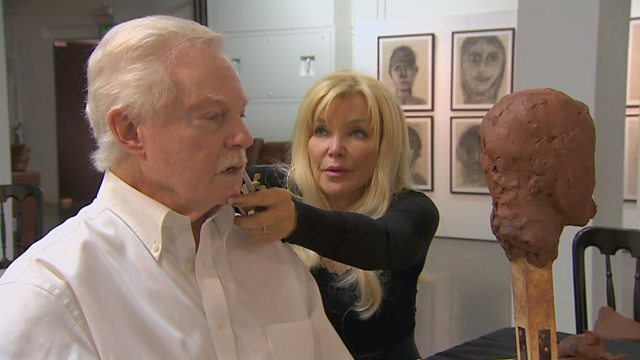 Frances Segelman, figurative sculptor is about to sculpt well known actor Derek Jacobi at a live sculpture event for charity. Beginning the artwork, she explains when sculpting from life that the process is much quicker than working from photographs. She has a two hour deadline and so works swiftly but constantly reviews and assesses her work comparing her sculpture. The process is very pressurised as it has to be completed so quickly. Time lapse photography show all the different stages with Frances sculpting and reshaping and modelling the clay. She turns the bust around looking at it from all angles, each time she does one part it changes another part. Derek Jacobi is delighted with the final sculpture and agrees that it resembles him.